One thing I like about having a workstation at work is the fact I can bring my own peripherals to use them there. Obviously, my workplace provided me with some OEM peripherals to start with, but I wanted something better. Back on my internship at Lockheed Martin, they actually prohibited workers from bringing their own mice or keyboards to work, because they were worried about security threats with peripherals from unknown sources. As I was an intern, I did not know this rule. It was not until a few months later when I was scolded by the systems administrators and was told to put it away. Thankfully, the security at my current workplace is a lot more relaxed. Within a week of starting at Calgary Scientific Inc., I brought all my peripherals, including a tenkeyless keyboard, the Cooler Master Storm NovaTouch TKL. To be quite honest, I chose this keyboard in particular because I wanted something smaller. Majority of my typing is spent on the home row without using the number pad, so I knew I would not really miss it. In addition, my current desk at work could benefit from having some extra space. However, even if I did have enough table space, there is just something about a smaller keyboard that looks much cleaner. Today, we have yet another TKL keyboard in the form of the Cooler Master MasterKeys S PBT. Featuring the same sleek design with Cherry MX switches and harder PBT keycaps, I have to ask, is this a worthy keyboard to be brought to work? Or are there too many compromises in this small keyboard? Read on to find out! 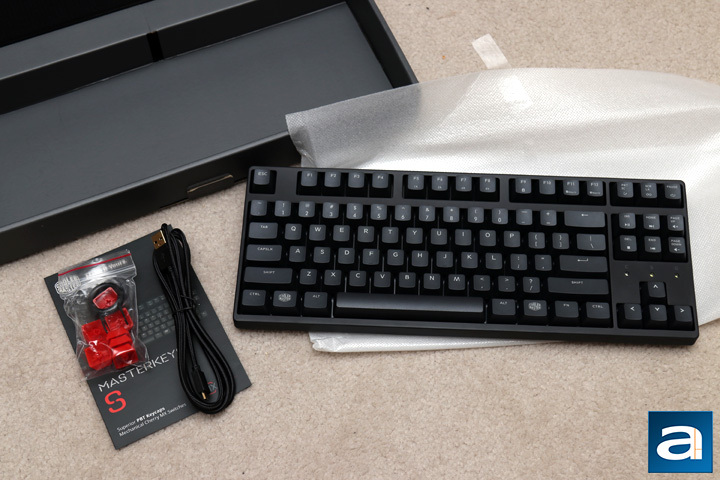 Today's review unit of the Cooler Master MasterKeys S PBT arrived from Cooler Master's offices in Chino, California. 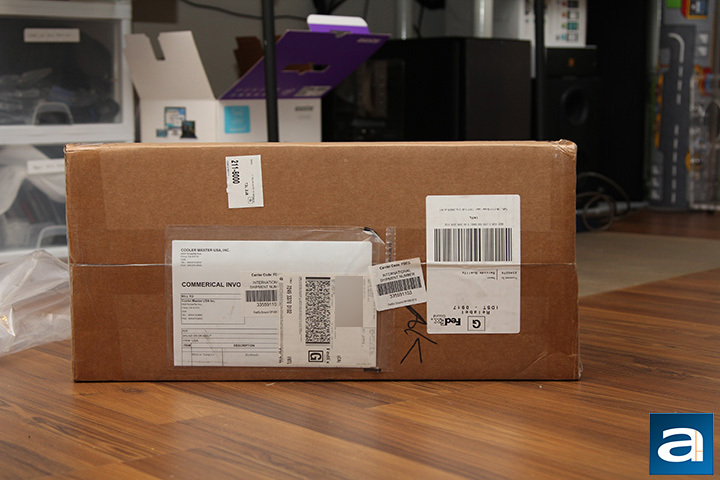 Traveling with FedEx and their International Ground service, the brown corrugated cardboard box arrived in good condition. There are no dents or bruises to speak of here, which should translate into a non-dented device inside too. Along with the small tenkeyless version we are reviewing today, we also received the full 104-keys version, which my fellow editor Hai Wang will be looking at in the coming weeks. Otherwise, there is not much else to speak of, so let us take a closer look at the retail container. 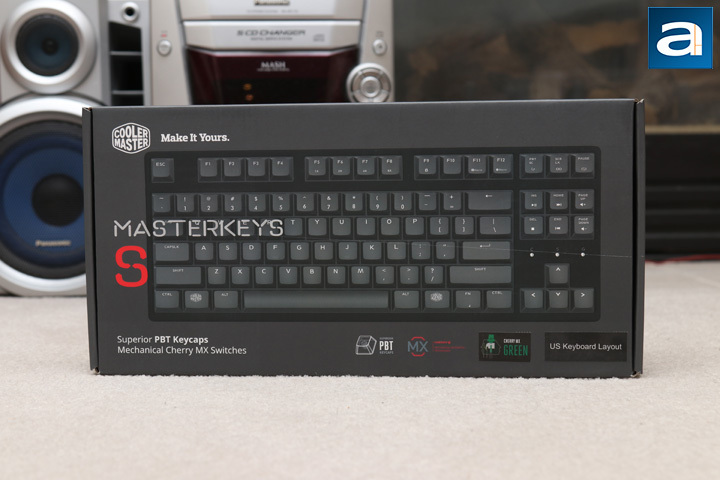 Just like the other Cooler Master products we have seen, the MasterKeys S PBT retail container follows suit with a dark gray background and the product shown on the front. I know it may sound silly to say, but the box feels really solid, as the cardboard is thicker and sturdier than other boxes I have held. The front shows Cooler Master's logo on the top left with the product name in the middle. At the bottom, we have an extra tagline of "Superior PBT Keycaps", which is a major feature of this lineup from Cooler Master. The front also shows this keyboard comes to us in the US Keyboard Layout with Cherry MX Green switches inside. All of these details will be explained later on in our review. At the back of the box, we have a few more features explained in detail. Out of the box, we have a few things to speak of. Inside a white foam bag, we have the Cooler Master MasterKeys S PBT sealed with some tape. Inside, we also have a braided micro USB to USB cable, measuring 1.5 meters in length. It is a bit short, as I am quite used to having at least an extra thirty centimeters, though this is not a huge deal. 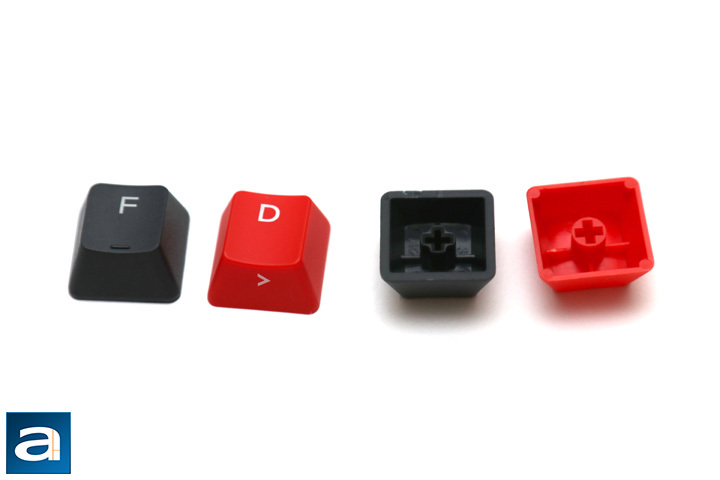 Otherwise, we also have some red replacement keycaps for the major keys used in FPS and MMO games, a plastic keycap remover, and a small manual. Interestingly enough, this might be a manual you will need to look at; you will understand what I mean later on. As with the other Cooler Master MasterKeys Pro keyboards we have seen before, the MasterKeys S PBT share many similar traits in the aesthetics department. From here, you can see a relatively slim frame circling around the keys. This takes the same framed approach, unlike the island style keys we have seen. The whole keyboard is plastic, finished with a matte black surface. This does catch a lot of oily fingerprints still. Otherwise, this is as plain as a keyboard will come, though this is not necessarily a bad thing. With this understated design, it may not attract the gamer crowd, but it definitely is simplistic and clean. The lack of color and subtle branding makes this keyboard fit well in the office environment. In addition, a lot of keyboard enthusiasts will like this slimmer design, as there are no unnecessary aesthetic features to take up space. Unfortunately, this also translates into a missing wrist rest; something Cooler Master has not provided in many of their keyboards to date. It is quite disappointing, as I would have loved to see a small palm holder included. As for dimensions, the keyboard is 356mm in width, 33mm in height, and 135mm in depth. Compared to other tenkeyless keyboards like the NovaTouch TKL, these dimensions are quite similar, with the Cooler Master MasterKeys S PBT being slightly smaller on all axes. In terms of mass, this keyboard is also relatively light at 970g. However, this lightness can be attributed to the materials used on the MasterKeys S PBT. The entire shell of the keyboard is made up of hard plastic. A metal backplate sits underneath the keys to keep the board sturdy. Overall, there is zero flex near the keys or in the board, though the board itself exhibits a bit of creaking when twisted. On a day to day use though, I doubt you will be torquing your MasterKeys S PBT as much as I did, and the keyboard still feels pretty solid. 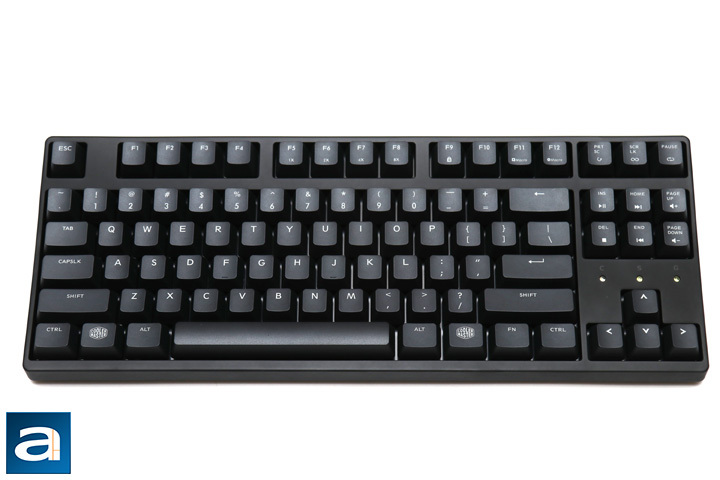 The Cooler Master MasterKeys S PBT came to us in a standard 87-key QWERTY ANSI layout. As such, most of the keyboard is laid out in the same way as every other keyboard sent to APH Networks. One difference is the use of the Windows key on both sides rather than having the right Windows button act as a right click button. The keycaps are excellent in quality, and I will get to these later on. One neat thing Cooler Master has implemented with this keyboard is the ability to switch layouts in terms of how it interprets the keys. Using the function key and specific keys, you can swap this from the standard QWERTY input to the Dvorak or the Workman layout. While these layouts are lesser known, I know a few friends who have used these layouts. In addition, you can also change the keyboard for Windows, Mac, or Linux use. While you may not think this is an issue, this allows keys to be remapped for things like the Apple command key or the Super keys in Linux. I may not use these different layouts myself, but I think it is just cool that Cooler Master has implemented this so seamlessly. Otherwise, other function keys can be found around the entire keyboard. They can be activated by pressing the Fn button in addition to the respective keys. Media keys can be found on the right side where the six keys are bunched together. This includes Play/Pause, Stop, Previous, Next, Volume Up, and Volume Down. Interestingly, no mute button is included here. On the function row, we have F5 to F8, which configure the repeat rate of the keys. F9 is used to lock the Windows key for gaming. F11 to Pause keys are used for recording macros. As Cooler Master does not bundle any software with the keyboard, this is the only way you can create and use the macro. F11 and F12 are used to record and delete macros, respectively. Fn + Print Screen activates the macro once, while Fn + Scroll Lock repeats the macro. Clicking Fn + Pause will finally cause this macro to repeat an infinite times. Recording macros is not straight-forward with this implementation, and I personally would wish for more documentation or the complete removal of the macro recording. The only feedback you get while recording is from the three indicator LEDs located above the directional pad. Speaking of which, these three white lights are used to indicate Caps Lock, Scroll Lock, and Gaming Mode. This gaming light shows up when the Windows lock key is active. Finally, if you realize you have messed everything up, you can hold Fn and E to reset all the settings of the keyboard. As for key rollover, the Cooler Master MasterKeys S PBT offers NKRO over USB. NKRO is abbreviated for n-key rollover, which refers to the number of keys independently scanned by the hardware. In essence, this fixes ghosting issues found in cheaper and/or laptop keyboards. While ghosting is a marketing term, there are cases where keyboards will not be able to recognize more than one keystroke at a time, causing for missed keys. This can be frustrating when you are playing games, or even if you are just a very fast typist. On an aside, the original usage of ghosting in keyboards actually referred to a third key being registered when two other keys were pressed, which thankfully is not a problem with most modern keyboards. Before continuing on, one of the main selling points of the Cooler Master MasterKeys S PBT is the mechanical key switches. There are three main types of keyboards in the market today. The cheapest but most common is the membrane keyboard, which is the easiest to make, but also has poor typing feel and response due to squishy keys. Next is a scissor switch keyboard. This can be thought of as an enhanced rubber dome with two extra interlocking plastic pieces connected to the key and the keyboard. This creates a better tactile response and typing experience in comparison to the aforementioned membrane. 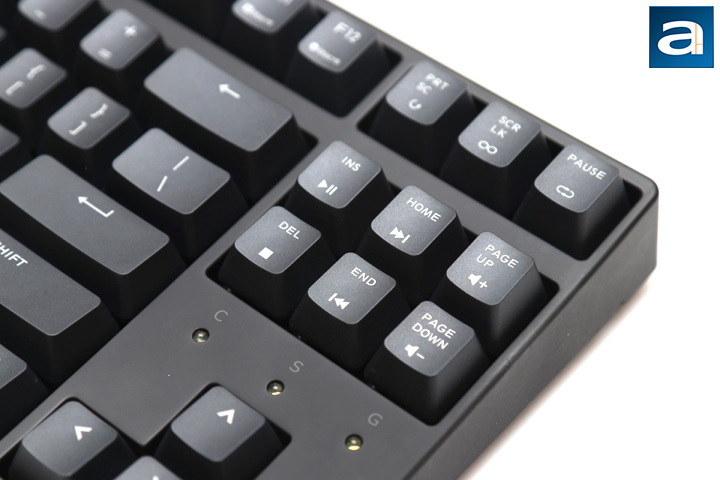 Mechanical keyboards, such as the MasterKeys S PBT, costs the most, because each key switch is an independent part. These switches are generally composed of a base, stem, and spring, with varying degrees of tactile and audible feedback. 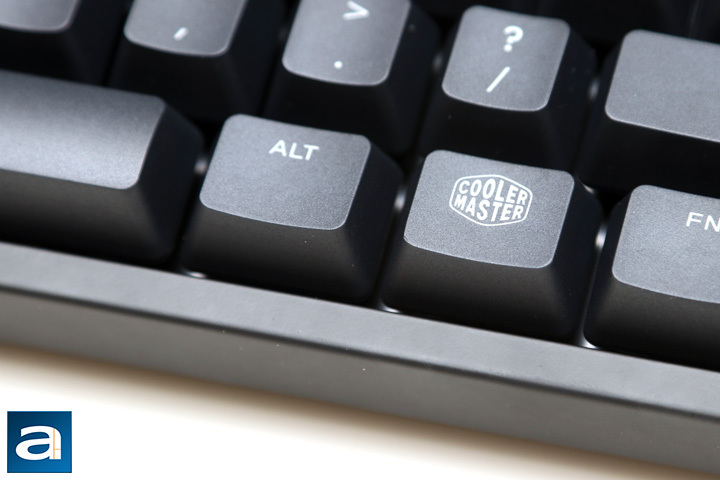 Our unit of the Cooler Master MasterKeys S PBT features Cherry MX Green mechanical switches. These keys are rated to last up to fifty million keystrokes. Green switches are another type of hybrid switch, but unlike the Browns, this combines the clicky design of the Blues with the heavier actuation force of Blacks. As such, the Greens feature a relatively high resistance to typing and an actuation force of around 80g to trigger them. Thankfully, the MasterKeys S PBT comes in other switch types of Cherry MX Red, Blue, Brown, and Silver. As you might already know, one big feature of the Cooler Master MasterKeys S PBT is the PBT keycaps. The most commonly used keycaps are made up of ABS, or acrylonitrile butadiene styrene. They offer decent quality, but are also seen as inferior compared to PBT, or polybutylene terephthalate, which are stiffer, harder, and keep their color better. They also generally are more resistant to heavy use, and thus do not exhibit the shine effect after prolonged use. From the photo above, you can see the difference between the extra red ABS keycaps Cooler Master has provided and the thicker PBT keycaps pre-installed on the board. As for the lettering on the keys, these are laser-etched rather than a doubleshot injection. This means the legend of the keys will wear out sooner. Otherwise, the surface of the keycaps feels quite nice. The font the legend is printed in looks clean and professional, following in a similar design language as the rest of the MasterKeys S PBT. Unfortunately, this printed on font also means there are no LEDs with this keyboard, whether we are talking about RGB or single color. Even if you do not like the rainbow craze that is happening, I do still find value in having a backlit keyboard, especially when working in a darker environment. The last place to inspect is the Cooler Master MasterKeys S PBT is the underside of the keyboard, as there are actually some interesting things here. Just like some other Cooler Master keyboards we reviewed in the past, the MasterKeys S PBT has cable routing valleys in the bottom side. This allows users to lead the braided detachable cable out the back, left, or right side. I really quite like this implementation, as it allows users to move the cables away from always going out the back. In the end, it definitely just comes down to your setup, but it is great to see the flexibility. 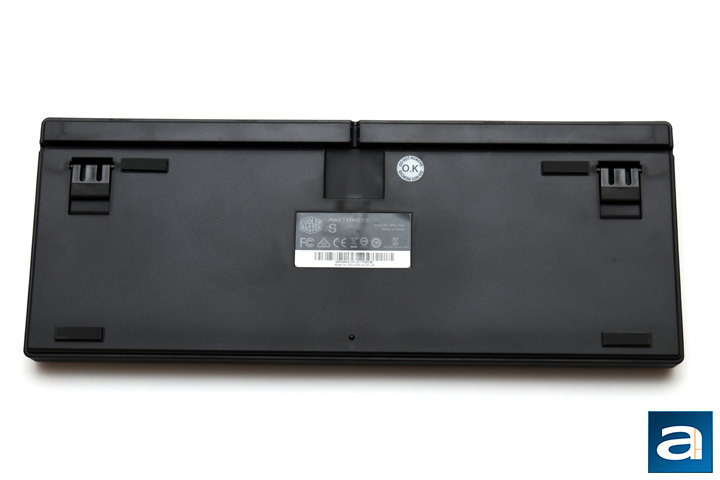 Otherwise, we have four rubber rectangles to keep the keyboard from unintentionally moving. Two flip feet kick out at the back if you want to raise your keyboard, and they too have rubber ends to prevent any sliding. 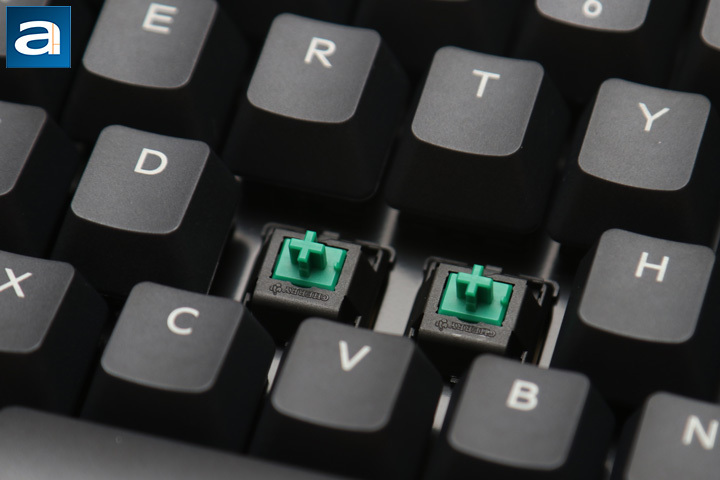 The last time I used any sort of Cherry MX Green switch, it was on the Cooler Master Storm QuickFire XT, and only one or two of the keys had these heavy switches. So this is probably one of the first times in a while where I did not know what to expect with the Cooler Master MasterKeys S PBT. After reviewing many keyboards here at APH Networks, I can attest to the fact it takes a while to switch between flavors of mechanical switches. As I have said before, these Green switches are like a mix between Blues and Blacks. The clickiness is like Cherry MX Blues and it really makes this keyboard a pure joy to type on. It also makes you sound a lot more productive than you actually are, haha. Unfortunately, this is not always great for the office, where some people prefer a quieter environment. In addition, when you mix in the heavy actuation force required to press, it also feels like you are giving your fingers a real workout. After using the keyboard for the past three reviews, including this one, I can safely say the Cherry MX Green are not my favorite switch, as it is quite heavy to press. As we have noted though, other switches are available with this board. For gaming, it is definitely louder noise in comparison to the Cherry MX Reds, and double pressing may be an issue depending on what you are playing. As for overall quality of the Cherry MX Green switch, these are pretty much as I expect from any Cherry switch, which is excellent. All keys are consistent in feel and feedback. To answer the question at the beginning, I would have to say I would not be bringing this keyboard into the office. While there is nothing wrong with this keyboard, I think my co-workers would prefer a quieter environment, and Cherry MX switches are still too loud. 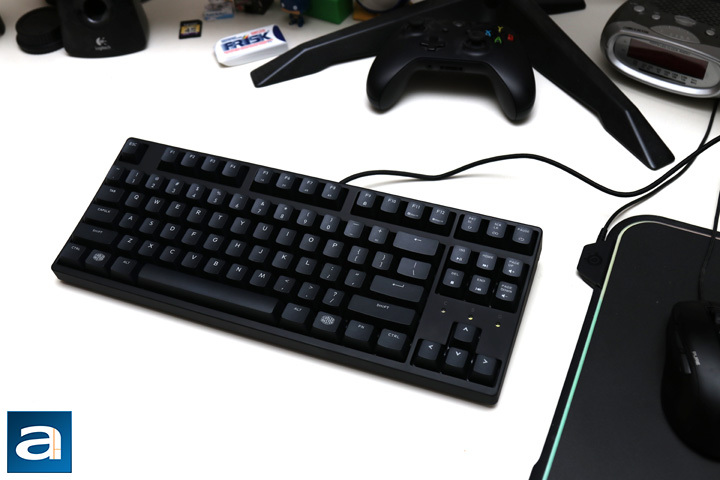 However, when it comes to the Cooler Master MasterKeys S PBT as a whole, I think Cooler Master has struck the right balance in producing a no-nonsense, clean, and functional mechanical keyboard. Starting at the top, the build quality is pretty good with the MasterKeys S PBT, with good materials used for the frame and backplate. Different features are also seen here, allowing users to change the layout to other keyboard layouts or for different operating systems. Furthermore, we can see the enthusiast-like feature of including superb quality keycaps. Finally, it is great just to see genuine Cherry MX switches here, as they feel crisp and consistent. The board itself exhibits a bit of creaking when twisted, but this is probably not something you will encounter on a daily basis. While macro recording is available, I felt like this feature was executed poorly, and it took me a while to understand how it worked. This feature alone would benefit from either some rework or some software for better user interaction. Otherwise, the things I do not like about the MasterKeys S PBT involve all the features missing from this basic mechanical keyboard. This includes items like a wrist rest or backlit keys. However, when you see how simple and generally well implemented this keyboard, and factor into the $80 USD price, I think this is actually a really good deal. If you are looking for a wallet-friendly, down-to-earth, tenkeyless mechanical keyboard, then the Cooler Master MasterKeys S PBT should be near, if not at, the top of your list. The Cooler Master MasterKeys S PBT is a great bang-for-your-buck mechanical keyboard with Cherry MX switches to boot. Do you have any comments or questions about the Cooler Master MasterKeys S PBT? Drop by our Forums. Registration is free, and it only takes a minute! posted 10 hours and 34 minutes ago, with 11 posts. posted 12 hours and 49 minutes ago, with 8 posts. posted 21 hours and 25 minutes ago, with 2 posts.